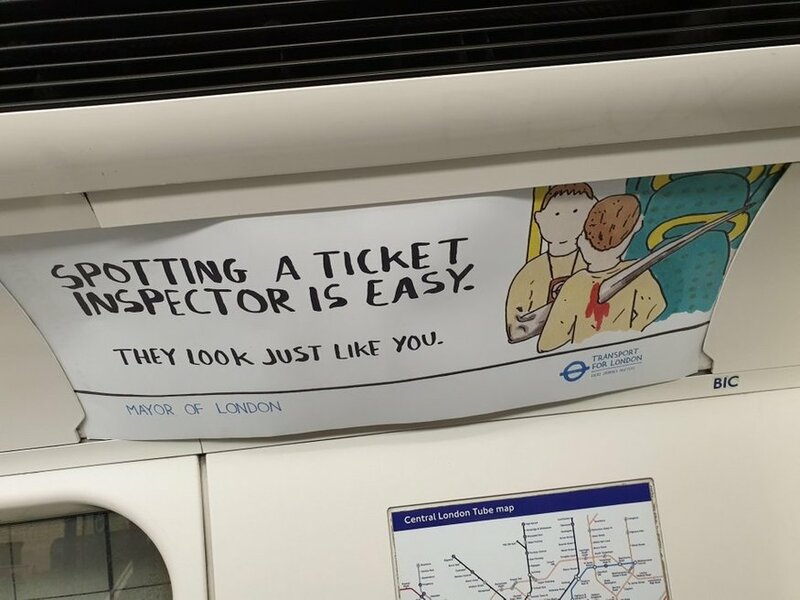 Spotted One Of These Rogue Ticket Inspector Ads On The Tube? Will Noble Spotted One Of These Rogue Ticket Inspector Ads On The Tube? Spotting a ticket inspector is easy. They look just like you. TfL often posts reminders that plain clothes ticket inspectors patrol London's transport system i.e. "Make sure you've got a valid ticket, mate." But this particular campaign — spotted recently on the Victoria line by David Parker — has a somewhat grizzly ending. It's a reference (we can only presume) to a shapeshifting T-1000, from the 1991 Arnie action movie Terminator 2: Judgement Day. The android assassin has the ability to ape the form of beings, as well as grow itself scissor-like arms, on which to skewer unsuspecting unfortunates. Just think Edward Scissorhands gone AWOL.